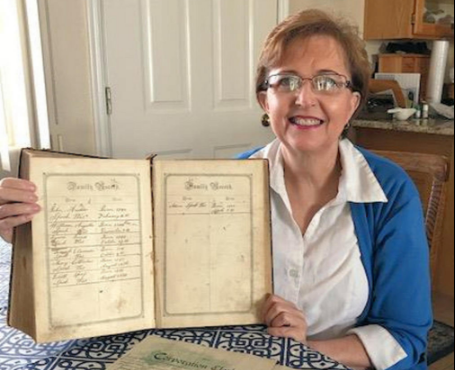 RaQuelle Owens restored an 1850 family Bible to its original family line after she felt compelled to reach out to one of its descendants, Leilani Speck, through Ancestry.com. Owens, a member of the Church who found the Bible while cleaning out a closet at her home in Lakeside, Arizona, said the book was given to her father in about 1975 by a Mr. Speck, one of his real estate employees. Owens kept the Bible for 25 years after her parents died, and this January she felt the need to find a place for it. She looked up the oldest name written in the Speck family Bible on Ancestry.com, researched Public Member Trees associated with the record and saw that Leilani Speck was LDS and had recently been active on the Ancestry website. “I just can’t emphasize enough how strongly I felt when I saw her name that she was the one to have it,” Owens said. Owens sent a message to Speck through Ancestry.com, explaining she had the Bible. Speck, a member of the Church in Hurricane, Utah, expressed her interest in seeing the book, and Owens mailed it to her. That same month, Speck was diagnosed with cancer. She received the family Bible the day after she got out of the hospital following her first surgery. Ronnie, you could try finding some of the deceased people in the book in Family Tree on FamilySearch.org (familysearch.org/tree), and then determining which users contributed the information. You may be able to contact a relative that way. I have been trying to find a family by the name of Garforth for several years. A book, "The Journey From Aleppo to Jerusalem" came into my possession some 35 years ago. In the front and back leaves, it carries handwritten in ink with a steel nib certain essential genealogical information for a family by the name of Garforth. Garforth is also a place name close to Leeds in Yorkshire, England. If anyone connected with the Garforth family will satisfy me that they are linked, then I will be pleased to make a gift of the book.